Ladies, and Gentlemen! I had the privilege of meeting Trish, aka "Soapy Blessings"
about 6 months ago. We both "blog" at a mutual friend's blog, The Soap Queen. I checked out her blog, her story, and her shops. What I saw, was so charming and so full of life and love that I had to tell you. So, grab another cup of coffee, settle down and enjoy this interview! Kelly: Hello, Trish and thank you for joining me here today! 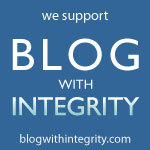 Trish: Thanks for asking me to join in taking a part in your blog. It is such an honor and blessing to me. Kelly: Tell us, how young are you? Kelly: What is the name of your business? Kelly: When did you begin your business? Trish: The actual, official business started about 5 years ago, but the concept went back much further than that. Kelly: Do you have any background in business? Trish: When I was a 4 year old, I went and picked flowers, then went from house to house, selling them. I went back again and again, week after week, even to the houses that never bought anything. I wouldn’t give up! Next, I sold unique handmade Christmas ornaments of my own design when I was 8 years old. At 14, I made and sold handmade suede handbags. As a young adult, I designed and created my own wardrobe and people would constantly ask where I “bought it”. I ended sewing original designed wedding dresses, day wear, and jackets to friends and acquaintances. All of these endeavors were a direct result of my entrepreneurial personality and was simply a natural way to express myself. None of these endeavors were because I wanted to make money, be famous, or make a name for myself. I just wanted to create! Kelly: What motivated you to start Soapy Blessings by Trish ? Trish: Soapy Blessings by Trish started with a fictional story written several years ago. To survive a civil war in a Latin American country, a character in the book made soaps . She prayed over every soap in to bring healing and peace to everyone they touched. Her soaps began to be sought out by the locals and eventually the region because the effect became legendary.Unfortunately, the character in the book did not survive the first draft, but the concept survived…and so Soapy Blessings began. Each item from Soapy Blessings has similar prayers as the soap maker from the book. Kelly: Soapy Blessings' name has a meaning; please tell us about name? Kelly: That is very interesting! What is your favorite product? Trish: I always have a problem when folks ask me what is my favorite anything! It’s kind of like asking who is your favorite kid! I don’t have favorites among my kids because each is special in his or her own way, and the same thing goes for my soaps! Each batch of my soap is made once and then I have never made the same thing twice! All are limited editions! However, because of several requests by customers, I’m considering making a signature line of soaps that stay basically the same. RIGHT NOW a favorite soap of my is Champagne Bubbles. http://www.etsy.com/view_listing.php?listing_id=30649534 This soap contains real champagne, but has a nice, fresh, gently fruity fragrance. The fragrance is unique in that people say they can “smell the bubbles”. That’s the only way I can describe it. Plus, I added fun hand-milled little soap bubbles in the soap itself for a fun effect . Kelly: What are some of your featured products? Trish: Because it is entering the Fall season, I’m featuring bringing in some “fall soaps”. Currently, I have just finished making Lavender Rose, Dragon’s Blood, Fresh Apple and Orange Coconut Milk soaps. So, Orange Coconut Milk and Lavender Rose isn’t exactly a fall soap. I made them because there has been a lot of requests for them. They are not all listed yet because they are not ready. 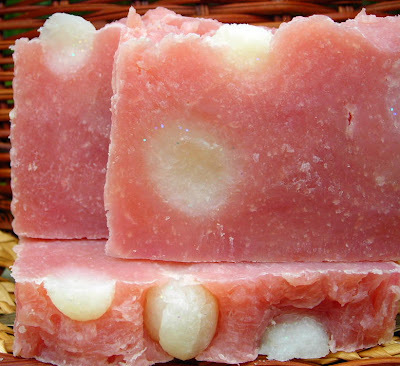 Cold process soaps must cure a minimum of 4 weeks before they are ready to sell. Today, I will be making a batch of Pumpkin Pie Spice and Cranberry Orange Spice, two that I made last year too, but this year, they are just a bit different…remember, I don’t usually make the same batch of soap the same way. Kelly: What are your business goals this year? Trish: I’ve already passed the goal where my sales allow my business to be completely self-sufficient in covering costs of supplies, advertising and craft shows. I haven’t quite made the goal of covering my insurance costs on top of that. That is one goal this year. I plan to attend more craft shows, Saturday markets and Christmas bazaars this year too. I plan to create a “signature soap collection” that stays the same due to overwhelming customer requests. I’d like to get my soaps into a few more shops that feature my product line also. I think that’s enough for one year. The rest of my ideas can wait until next year! Kelly: How do you get traffic to your website? Trish: I try to streamline my time in this area because I have so little time to waste. Driving traffic to my site requires a lot of time on the computer, promoting, promoting and promoting. I don’t have a sales rep on my staff…oh, wait, yes I do…It’s ME! I wear many hats. I do have more than one shop site online, although my etsy site is probably my most successful shop site. I partake minimally in etsy forums as they are known to drive traffic to your site, but I don’t spend hours there. I do partake in several social web sites related to handmade items, Christian web sites, Facebook, My Space etc. I make comments, blog a bit and put up pictures on these sites. Yes, I have a Facebook fan page too. It is brand new though, so still in its infancy stage. I also have a blog site at http://jabonsoaps.blogspot.com/ where I feature new listings, talk about soaping in general, and other things that randomly come into my head. In fact, one time I blogged about my daughter having a life time, backstage pass to all My Chemical Romance concerts, a band that is popular among teens and young adults. I showed pictures of the band with her standing there, smiling. Totally unrelated to soap, but I received some amazing results because of it. Other sites related to My Chemical Romance and music found my soapy blog and featured it on their sites. The sales skyrocketed for about a month! So, I found that diverse blogging isn’t necessarily a bad thing. office…except when my mouth has Novocain in it! I also have a twitter site at http://twitter.com/SoapyBlessings where I also post my new listings, sold items and retweet, retweet, retweet, support my fellow crafters, feature treasuries on etsy, and post some inspirational quotes. I use Twuffer to help me in posting on a regular basis so I don’t have to be on Twitter 24/7. Kelly: How do you juggle work/life balance? Trish: This was a hard balance for me to maintain initially. I put my heart into my soaps, but my work is necessary to pay the rest of the bills. I work full time as a registered nurse, which takes a lot out of me. By the time I get home, there isn’t much of me left! I’ve chosen to set a date for my soap days. I plan them all a month in advance and keep the dates for my soap business. Generally, I devote one day a week to nothing but making and packaging soap. I also work on necessary things related to my business other days of the week, but they do not take priority on those days. The rest of my six days a week is divided between work, family and church. Kelly: Can you share some of your frustrations? Trish: There never seems to be enough time, but I’ve learned lots of ways of managing my time to make it work out. I’d love to see more interest in handmade soaps among the general population. I think it is just a matter of education, so I work very hard at spreading the word about it. 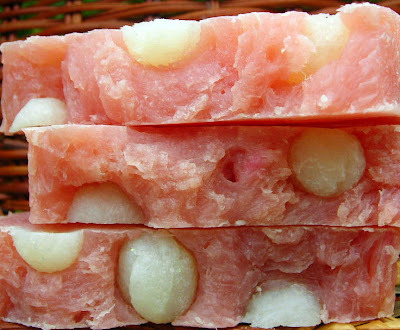 Each and every soap order I include information about handmade soaps and their benefits. Developing a strong, faithful customer base has been a work in progress also. Kelly: What is the most valuable lesson you have learned? Trish: I’ve become more of an expert in business management than I ever thought I would. I’ve learned a lot of lessons on how to promote myself as a business. Mostly, I’ve learned lots about managing my time!What role does your faith play in your business? Without my faith, there wouldn’t be a Soapy Blessings by Trish in its current format. I based my business on a fictional character in a (mostly) fictional book about a strong woman of God who made soaps in a mountainous region where rebel fighting was rampant. She wanted to do more than just survive and make a living; she wanted to make a change in her surroundings by way of her faith and her soap. This concept is what MY business is based on. It isn’t just soap; it is God moving through my soap, my business and into other people’s lives. I honestly have to say that it isn’t just my business. It is God’s business. He just happened to make me the manager of it! Kelly: What word of encouragement can you give a person who wants to also start their own business? Trish: Nothing happens overnight! Don’t follow what all the rest are doing, make your own work! Talk it up. Get ideas from others but don’t copy. Research, research, research ideas and ways to get yourself out there, but if an idea comes up, don’t be afraid to give it a trial. Everyone’s situation is different and you need to work your business around your life. Don’t let your business take over your life, let it flow with your life. Start simple, start with a single idea if that is all you have and build it from there. DO collaborate with other small businesses, networking is a must! You are not an island alone out in this world. Your customers are your business collaborators, friends, family, co-workers; in fact EVERY person and business you come across is your customer. Kelly: Any other thing you would like to share with us?! Trish: Just that I have a Facebook Fan Page at www.facebook.com/pages/Soapy-Blessings-by-Trish/121356503189 and recently started a newsletter that will be going out approximately every other month. There will specials, contests, and fun things on the newsletter that won’t be found anywhere else! Currently, I have a section on my blog site where you can vote for your favorite soap. If you vote, join my newsletter and let me know what you voted for, you will have a chance to win the soap that you voted for! Kelly: Wow, Trish. You gave this interview 150%! I so appreciate your graciousness in letting us behind the scenes of you, and Soapy Blessings! I know your time is limited so I really appreciate the time it took to be here with us. Our prayer for you is that you would prosper beyond your wildest 3:00AM dreams and become a woman of stature in this realm of business. I love your heart and I am cheering you on! The time is now and you are seizing the day and the hour in which we live! Love you, girl! Friends, this concludes our interview #2 of Women in Business Spotlight #2. For the first lady entrepreneur that I interviewed, please click here. Now, take another second and please head on over to Soapy Blessings, and feel free to comment here as well! She's a wonderful person as well as a gifted crafter! Always thinking of others and helping them along the way! Beautiful person inside and out! Awesome write up too!!! I don't "know" Trish in person but I do know her via Etsy. I agree with Valerie! It was great getting to learn more about Trish! She is such a great lady. I just love her soaps so much! Thanks, Valerie, Linda, and Vanessa for sharing your thoughts on our lovely friend. I am so convinced from your comments that I might buy some too! Thank you for stopping by my little corner of google! Please do stop by again sometime! Or, we will see you on etsy soon! I will be sure to check out each of your shops. Kelly, you did a fantastic job on the interview. Patricia has a great business, and a very interesting craft. Oh,Patricia, you did well also. Just like me to forget about the star. I enjoyed our joint collaboration your photos and products made it easy. Trish is a Sweetie and she deserves the spot light! Her soaps look good enough to eat and her shop is so professionally done! Awesome interview. Love it! It is really great to know a little bit more about you Trish! What a great interview, Trish - it's great to hear people's stories. Nice interview! you both did a great job.